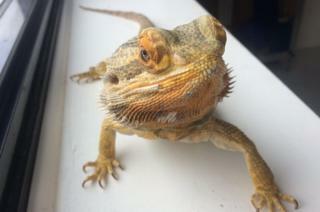 Two bearded dragons have been found abandoned in a cardboard box "dumped like rubbish." The lizards were found in Lynemouth, Northumberland, without food, water or heat, which the RSPCA warned is "essential" to their survival. The organisation described it as "irresponsible". Both lizards are being cared for by a vet in Stockton, Teesside, and will be transported to a specialist reptile centre to find a new home. Collection officer Terry Haley, who found the pair, said: "This poor pair of beautiful beardies had been cruelly dumped like rubbish in just a cardboard box. "It's such an irresponsible thing to do, as pet reptiles need to be kept in specific climate controlled enclosures to stay healthy and to carry out their normal behaviours." Bearded dragons, which have a life expectancy of 10 to 15 years, are one of the most popular forms of lizard in captivity in the UK. With a diet of insects and vegetables, they grow to about 45cm (18ins) in length, including their tail. The RSPCA said it rescued more than 1,600 reptiles last year with a rise in the number of calls relating to abandoned ones.